People argue over inflation’s effects and the expectations thereof but the CPI, which is the ultimate measure of inflation’s lagging effects, has never stopped to take a breather. 2008′s liquidation of the system? Child’s play. Inflation, which is what the Fed has been hysterically promoting since 2007, will always manifest in rising prices somewhere. As luck would have it, this time it is manifesting in the stock market to a greater degree than the CPI. ‘All good!’ think our policy makers if the right prices are rising. 30 year yields vs. the CPI show a bond market that refuses to do anything, over decades, as consumer prices rise. The 10 year is docile as well, apparently seeing deflation right around the next corner. The 5′s and 2′s also are on high alert for deflation. This is the response of our majestic Treasury bond market, former home of the legendary Bond Vigilantes, who would rise up against inflation. The problem is, considering the decades that the Continuum has been in a downtrend while prices rise, rise and rise some more, I think that (the bond vigilantes) was just another Wall Street Promotion in a long and storied line of them; Great Rotation being the latest. Moving on, despite all of the intellectualizing by various Fed members, media and the best and brightest in the financial services complex alike, the picture below is a view of exactly what the Fed is doing to combat rising prices over the various cycles. At least Greenspan put up a different kind of Straw Man of his own in 2004, pretending to fight inflationary fire before that whole thing folded in on itself and liquidated in 2008. No matter what the eggheads in Jackson Hole come up with this week, they are inflating and for the time being, the right assets are benefiting. 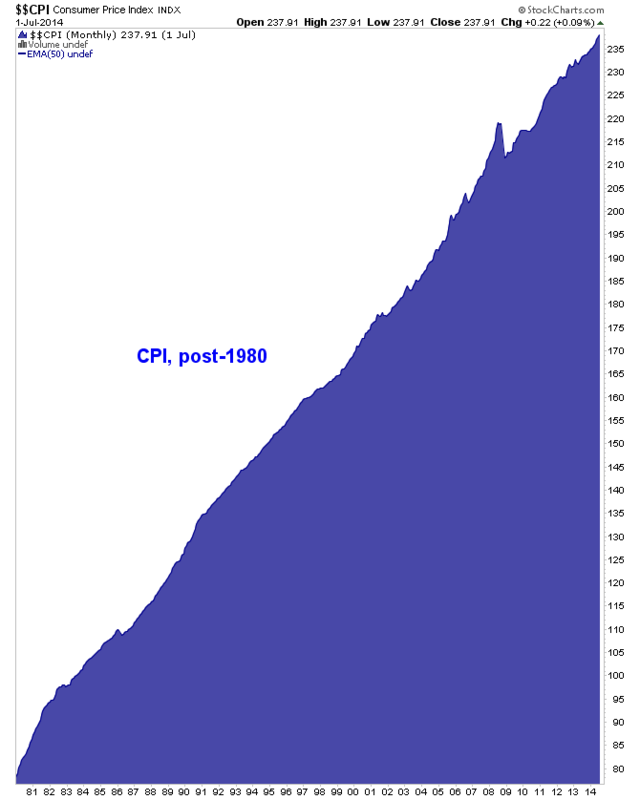 But the Fed Funds vs. CPI shows they don’t give a damned about a secular rise in consumer prices per the admittedly dramatic ‘portrait view’ of chart #2 above. Why? Find out why the deflation Straw Man has been stood up in the first place over all these years, and we’d probably have the answer to that question. Subscribe to NFTRH Premium for your 25-35 page weekly report, interim updates (including Key ETF charts) and NFTRH+ chart/trade ideas!